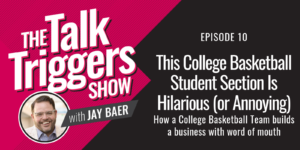 On this episode of The Talk Triggers Show, I share a story about how a university increased attendance at their college basketball games by 230%. It’s no secret that the crowds at a college basketball game don’t hold a candle against the swarm of fans that pack out NBA stadiums across the states. In fact, the average attendance for a college basketball game is just 4,686 people. And honestly, you can only expect those numbers on a really good day. 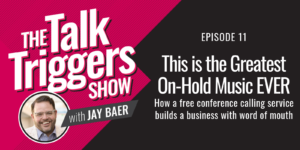 On this episode of The Talk Triggers Show, I share a story about a university that once struggled to fill 942 seats in the student section, when giving out tickets for free, and how they increased attendance by 230%. All thanks to a talk trigger that creates a ton of conversation. 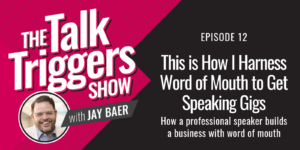 If you want to find out how a mediocre basketball team attracts thousands of spectators, despite being in a hyper-competitive sports market, check out episode 10 of The Talk Triggers Show! Make sure you never miss an episode by subscribing to The Talk Triggers Show on YouTube or to the podcast on your favorite podcast app.